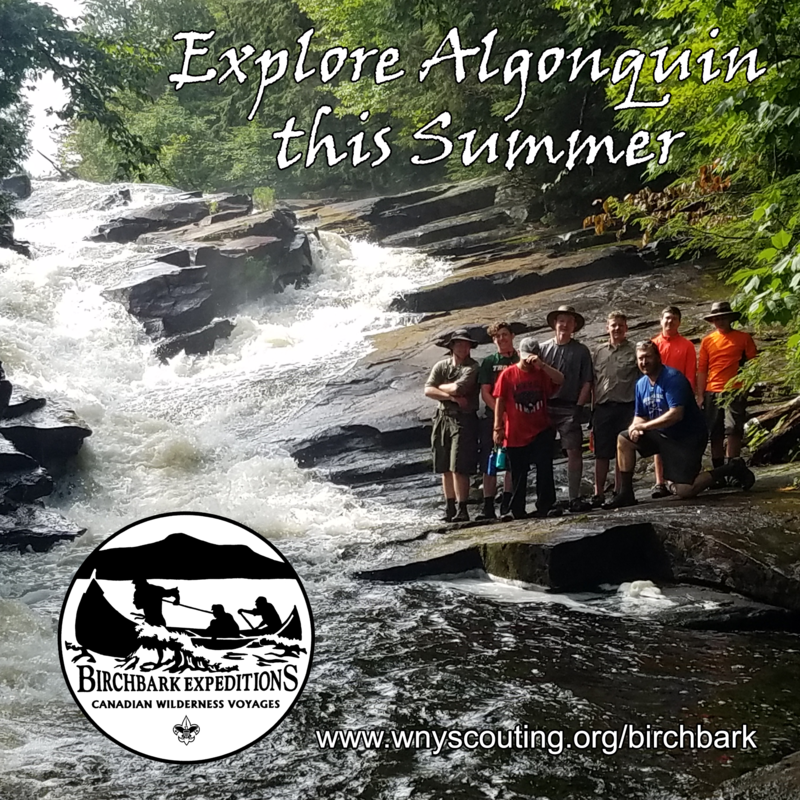 Birchbark Expeditions is a Nationally Accredited week-long, fully guided high adventure canoe experience, steeped in the rich Age of Exploration history of Upper Canada. The program is open to Scouts BSA and Venture Scouts at least 13 years old, holding the rank of at least First Class and a "swimmer". Crews generally consist of six youth, two adults, plus a trained guide - making nine total. The standard expedition takes place in Algonquin Provincial Park and offers world-class canoe tripping among the thousands of lakes and unspoiled wilderness. Advanced expeditions for crews with previous whitewater experience include extended two-week trips down the Missinaibi River. Standard expeditions start Saturday with an early drive from the Buffalo/Niagara area to Midland, Ont. for a visit to St. Marie among the Hurons and Wye Marsh Nature Center in Midland, Ontario. Here crews will meet their highly-trained Guide for the duration of our trip and learn about the early French explorers that carved a living out of the wilderness alongside the Native Americans. On Sunday, crews move on further north into Algonquin Provincial Park to base camp where they will organize equipment, practice some water rescue techniques and get rested for an early launch on Monday morning. Monday through Friday have crews following their custom pre-planned itinerary through the pristine lakes and forests of the Algonquin interior, enjoying the incredible views, wildlife and camaraderie. Crews return to base camp on Friday afternoon, clean up their crew gear, pick up some souvenirs and visit some of the incredible museums and other program offered by Algonquin Provincial Park. Crews depart early Saturday morning, driving back to the Buffalo/Niagara area. Crews from outside the Buffalo/Niagara area are encouraged to add a visit to Niagara Falls while in the area, with over-night facilities made available at Camp Stonehaven in Niagara County. Crews are provisioned with all necessary back country food and crew equipment, including: canoes, paddles, PFDs, tents and cooking equipment. Each participant must bring some basic high-adventure personal equipment. "Definitely a good value considering you guys handled the training, all the logistics for sites, canoes, tours, meals, etc,and the communication up to, during, and after the trip has been excellent." "This is an excellent council-run BSA High Adventure program ... at a fantastic price point." "I learned a lot from these folks. The skill level was outstanding!" "Had a great time and learned a lot of new techniques." The fees for the standard week-long program are as follows: $450/person for crews of 7 or 8 or $475/person for crews of 5 or 6 To secure a reservation, a non-refundable deposit of $400 is required per crew at the time of reservation. Make your reservation and submit a deposit before January 1st for a $25/person early bird discount! Don't delay, book your adventure today!